Emily Noriega is a first generation Peruvian-American born and raised in Fort Lauderdale, Florida. Growing up in South Florida, she quickly developed a strong interest in immigration and social justice. These interests drove her to pursue a B.A. in political science from Florida Gulf Coast University, graduating in 2012. As an undergraduate student, Emily participated in The Washington Center for Internships and Academic Seminars in Washington, D.C. During her time in the capital, she took part in the Political Leadership Program. She also served as the public policy and advocacy intern at Local Initiatives Support Corporation (LISC), a non-profit community development financial institution that supports community development corporations throughout the United States. She also volunteered at CASA de Maryland, helping to ameliorate undocumented, shadowed youths by applying to the Deferred Action for Childhood Arrivals (DACA) program. Emily has also dedicated her time to serving her hometown in South Florida, by working for Congresswoman Debbie Wasserman Schultz, where her primary responsibilities included constituent casework in immigration and the IRS. As a CHCI Public Policy Fellow, Emily hopes to gain a deeper understanding of the legislative process while primarily focusing on immigration. 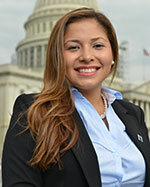 She aspires to be a voice for the Latino community and ascertain how to empower future Latino leaders. As a millennial Latino-American, Emily feels that it is her responsibility to promote education, participate in our community and work to make a difference.